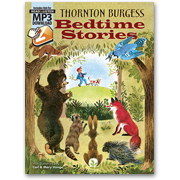 Beloved storyteller Thornton Burgess takes young children to the Green Forest to meet Peter Cottontail, Mrs. Quack, Jimmy Skunk, Danny Meadow Mouse, and other woodland friends. Children will delight in stories of Buster Bear's fishing trip, Paddy the Beaver's argument, Reddy Fox's new trick, and Unc' Billy Possum's escape. Twenty stories in all. Illustrated in a charming, mid-century style in color and black and white. 8-1/4"x11" Softcover. 112 pgs. Bonus! Includes a CD of the stories read aloud on easy-to-download MP3 files. This beautifully illustrated collection of stories is a recommended core text in the Preschool "Foundations in Literature" program included in CHC Lesson Plans for Preschool. Tour this title within the Preschool Interactive Guide!